Home » Side Dishes » Sides » Puree Duo of Pea & Rosemary and Carrot & Parsley Served with Grilled Pork. 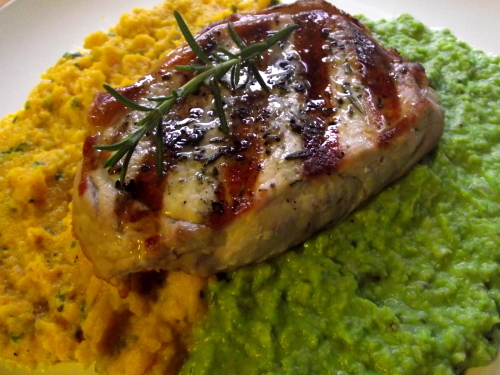 Puree Duo of Pea & Rosemary and Carrot & Parsley Served with Grilled Pork. I love puree. If you think of baby food when you hear that then you haven’t had a good one my friend. A true puree is a work of art- rich, creamy and delicious! Because my local farmers market has an almost overwhelming abundance of fresh veg, I went with shelling peas (which took me ages to shell) and fresh baby carrots. I’ve paired the purees with fresh herbs to give them depth and served it with a simple grilled boneless pork loin chop. Chop your carrots and then steam until very tender (you can boil them but steaming keeps in all of their flavor) In a food pro or blender add cooked carrots, salt & pepper, chopped parsley, and 1 tbsp of butter. Blend until relatively smooth. Add a few drops of milk at a time while blending to get a good texture. You want it smooth but not soupy. Cook peas until very tender in boiling salted water. In a small pan saute diced onions and rosemary in olive oil until onion is transparent. Add peas, tbsp of butter, onion mixture and salt & pepper to the food pro and blend until smooth. Again, add the milk or cream just a little at a time until puree is soft.